A couple of weeks ago, I received an e-mail with nothing more than a link to an album from an unsigned rapper out of Gary, Indiana calling himself Ill Eagle. With no other details to go on, I downloaded the album, The Wilhelm Scream, not knowing what to expect. That turned out to be a good thing, as the album contradicted much of what I've come to expect from a hip hop album in 2007. 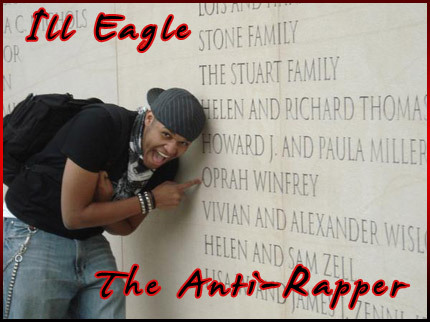 Living up to his self-proclaimed title of "The Anti-Rapper," Ill Eagle headed in a very different direction from the current trend of rap music with this release. On the surface, Eagle would seem to be far removed from most definitions of what constitutes "hip hop." He dresses more hipster than hip hop, a style he describes as "emo/punk/gangsta." Among his musical influences, he lists Bjork, Nirvana and Mitch Hedberg. And Eagle's music itself ventures deep into other genres, with several songs built around beats that would sound more at home at a rave or as the background music to a mosh pit. Yet having said that, at its core The Wilhelm Scream is most definitely a hip hop album, and a very good one at that. Eagle handles himself quite well on the mic, flipping spaced-out, often comical, metaphors into lyrics that touch on some fairly deep issues - the current state of hip hop, mental illness and racial identity are just a few of the topics covered in his rhymes. It takes a lot of risks and though its not without its flaws, there is a whole lot done right on the album. Ill Eagle's album is available on his MySpace page (along with a free preview of all the songs). If you're only checking for boom-bap beats, this may not be the album for you. Give it a chance, though, because there's some pretty innovative stuff on here. And for those of you wondering, the name of the album is a reference to a widely-used recording of a man screaming. Now you know.